It's really ideal for an escape from busy jobs with reading swimming, cooking in and out of the house. On top of all you can enjoy the magnificent view.The sea is less than 10 minutes walking distance through a path full of olive trees. The house has WiFi, air-conditioned bedroom, living room - kitchen, BBQ, and wooden oven outside, just 4 hundred meters from the port of Lakka. There you can find plenty taverns and restaurants, bars, super markets, cafe's, ATM and bakeries. 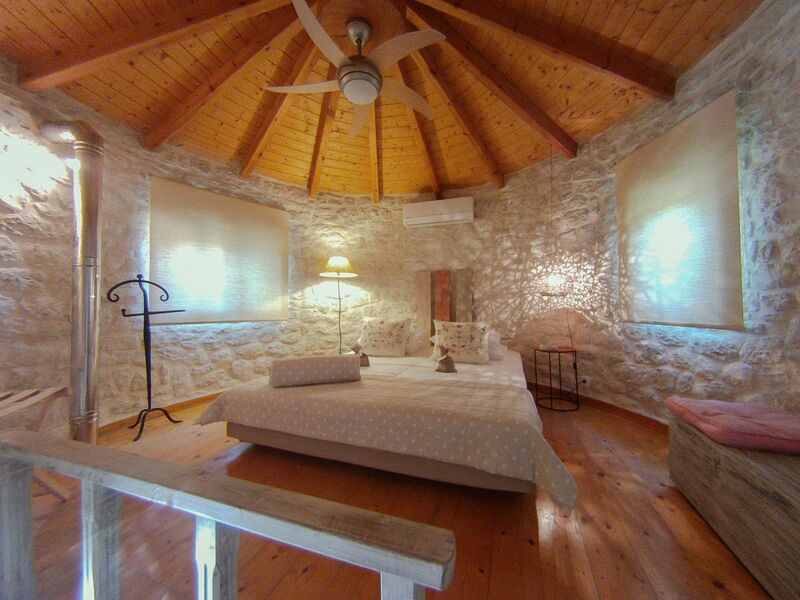 The house is located on the top of a hill over Lakka and as the rest of the island it is also covered by olive trees. We send to you a 'to do' list after the booking resevation. We chose Paxos as the destination of our honeymoon and we could not have found a better place to stay than the Beautiful Windmill! Yiannis and Magda took such good care of us, we felt like guests at their home. Spyros gave us very good recommendations of where to go, see, eat, drink, etc. We felt very welcome. The Windmill is indeed very beautiful, clean, well maintained and with the most wonderful features. Its garden, in particular, is such a great place to relax in after a long day around the island or to enjoy a meal and a glass of wine. The Windmill has a very good atmosphere about it and is definitely ideal for a stress-free holiday. Thank you for making our honeymoon so special and unique. Cute windmill. Lovely hosts. We went to relax but found the whole experience stressful. No internet. Not the owners fault. Solutions attempted though mostly unsuccessful. Hot water insufficient to wash your hair. It's located quite high up from the village of Lakka so be prepared for the hike up the hills. The hosts helped us organise a boat trip with skipper around Paxos and Anti Paxos. A great day! This nearly made up for the stressful trip until there was confusion over who was collecting the money and the price of the trip which was emphasised by the host arriving at our accommodation at 22.00 to discuss and collect monies. Not appropriate really. Overall, the concept of the windmill is cute but not worth the money. Dear Michael the main reason that the Windmill was not what you expected for is that the couple that came had never seen the property.The fist day they were looking for the pool.The Windmill of course has no pool we never say so but is very close to nicest beach of the island Orkos. As about the internet i am very sorry it was not our fault but we had to have a second option.At last in the three years that we host in the Windmill is the fist time that i hear about the warm water.Thank you for the notice and your review and i know that if you're in stress and don't no were you going is very difficult to be satisfied with something. We had a great time at the windmill and would highly recommend it! Situé proche du port de Lakka avec un accès facile à quelques jolies plages, le moulin est parfait pour découvrir l'île de Paxos. Magda la propriétaire est attentionnée et nous a prodigué de bons conseils tout au long du sejour. Merci beaucoup! Nous espérons vous accueillir à nouveau à l'avenir.